Ms Juan Xu had been a successful business woman in China with a family until fleeing to Australia in August this year after Chinese Police closed down her clothing factory two months earlier in Yancheng city, Jiangsu province where some of her employees were Falun Gong practitioners. The Chinese Police and the 610 office (secret police) suspected she was helping in the production of what Falun Gong practitioners call truth clarification material which informs people of the persecution of Falun Gong. 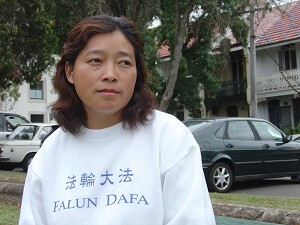 Ms Juan, a Falun Gong practitioner herself, also said that local practitioners were producing The Epoch Times special report “Nine Commentaries on the Communist Party” for distribution in the city after she smuggled an original copy into China after a visit to Australia earlier in the year. The Police closure of her factory was part of a local crackdown on Falun Gong practitioners that would see the arrest of an estimated 30 practitioners, 16 of whom were from her factory. Among those employees was a 28 year old woman who was at home looking after her 8 month old baby while her husband was away for work. Ms Juan said the police arrested the woman forcing her to leave her baby behind. Ms Juan had gone into hiding herself to another town when she made contact with the abducted woman&#039s husband who told her when he returned from his work travel he found his abandoned daughter had died of neglect. The Police would not tell him where they were holding his wife. Over the six years of the persecution of Falun Gong in China Ms Juan became aware of the severity of the persecution through personal experience – she said she witnessed the early mass arrests, assisted the teenage daughter of a neighbour who was raped by Police, heard the screams of naked Falun Gong practitioners being whipped in a country town police station. She was also informed by her cousin working at a mental hospital, of Falun Gong practitioners from labour camps who had refused to renounce the practise, being sent to mental hospitals to be injected with harmful chemicals. Similar incidents to this have been well documented by human rights organsiations. Ms Juan spoke of one practitioner, Li Qin, who was arrested in March 2000 for appealing for Falun Gong in Beijing who was sent to a detention centre where he was tortured into signing a statement renouncing the practise. On returning him to his home, at the front door, police ordered him to stamp his foot on a picture of the founder of the Falun Gong practise, Mr Li Hongzhi. “He refused and he was beaten non-stop till his left leg was broken. He was rearrested and sent to a labour camp where no one has heard of him since,” said Ms Juan through a translator. Li Qin&#039s wife and daughter had also practised Falun Gong and under torture had renounced the practise, but were not allowed to enter their home because of Li Qin being rearrested. They were unable to get help from relatives or friends because of the relentless state propaganda that had made them social outcasts. Ms Juan said she helped by giving them accommodation in her factory. “If parents practise Falun Gong their children will be discriminated against. In society you will be expelled from your workplace because no one will employ a Falun Gong practitioner,” said Ms Juan. “People echo the propaganda…[with] so many years under rule of the Communist Party the Chinese people have been indoctrinated with Party thinking, the Party culture, so if the Party says &#039you&#039re not good – then you&#039re not good&#039,” said Ms Juan. Ms Juan began the practice just before the crackdown so this fact was unknown by the Police. Over the years Ms Juan gave assistance to other Falun Gong practitioners, helped the children of practitioners receive schooling and also approached officials in her area. “I would use a third party identity to clarify the truth to officials and telling them [that practitioners] are good and compassionate to everyone,” said Ms Juan. In June when the police shut down her factory and froze her bank account she went into hiding. Through the assistance of others she was able to flee China and seek asylum in Australia. According to a report submitted in 2004 by the United Nations Special Rapporteur on Torture of the 115 countries covered, China received by far the most ink in the 420-page report. Of over 130 cases in the report concerning torture and abuse in China, approximately 100 of them were perpetrated against Falun Gong practitioners.